The Horological Society of New York (HSNY), America’s oldest watchmaking guild, founded in 1866, announces today Traveling Education stops in Silicon Valley and Houston this April. The nonprofit organization dedicated to advancing the art and science of horology is imparting horological education in two of the largest states, first hosted at Stephen Silver, Silicon Valley’s destination for extraordinary timepieces and jewelry on April 6-7. Texans can expect an unforgettable experience the following weekend when HSNY visits Houston, hosted at luxury jewellery and watches Swiss manufacturer Chopard on April 13-14. HSNY’s Traveling Education courses are four-hour hands-on experiences taught by expert watchmakers. Students can expect to work closely with instructors, who cover material from Horology 101-103 classes taught weekly in New York City, to include lessons in Movement Mechanics, Gear Training, and Winding & Setting. Throughout the course, students aim to discover what makes a mechanical watch tick by disassembling and reassembling a complete ETA 6497 movement and applying lessons in modern horology. No previous experience is required to take the course. For tickets, please visit HSNY’s Eventbrite page for a breakdown of dates and times. Ticket sales are reinvested directly back into HSNY’s ongoing educational mission. 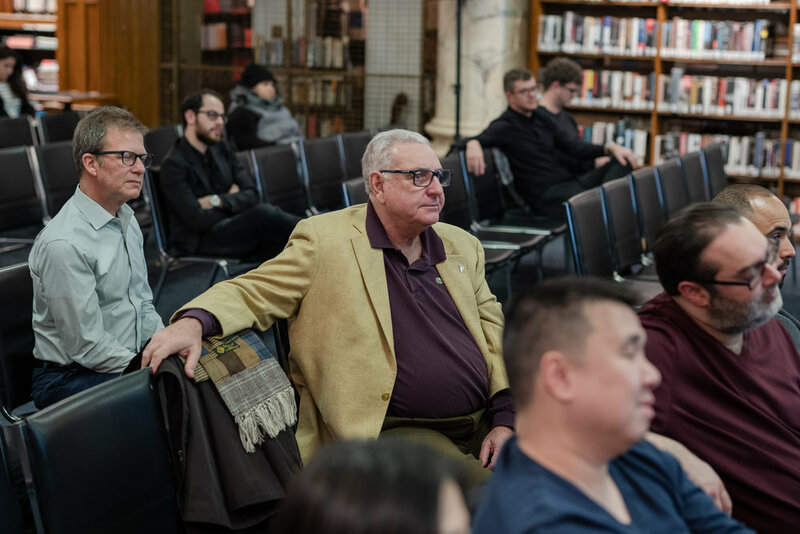 Given the increased interest in vintage watches, it was no surprise to see the incredible turnout for Eric Wind’s lecture titled Collecting Vintage Watches at the March 4, 2019 lecture series at the Horological Society of New York. Wind started the lecture by asking two questions: Why watches? 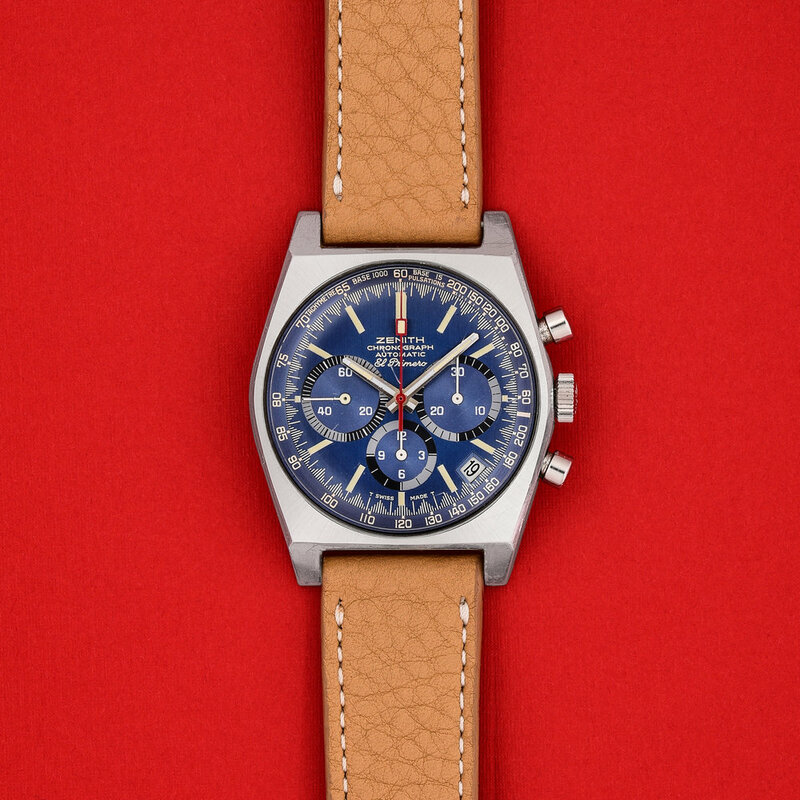 What makes a vintage watch valuable? As far as Wind was concerned, culture, possession, treating things well, and appreciation of history and heritage are justifiable reasons for ‘why watches’. For the next question, the following determinants were listed on what makes a vintage watch valuable: Quality, Complications, Condition, Scarcity/Rarity, Style, Provenance, Association, Freshness to Market, Competition and Other X-Factors. After all that wisdom, the audience received another dose of knowledge when Wind produced a watch checklist that included: Provence, Dial, “Lume” on Both, Case and Case Back, Serial Number(s), Manufacture Information, Movement, Other (such as pushers, crown, crystal, etc. ), Comparables (by Serial and Price) and Trend. Considering all the variables with the watch checklist, Wind urges watch collectors to think, “Does it make sense?” as well as “What makes a watch honest?” and “What forms of restoration is acceptable?”. There also was a thought experiment to ponder - “What is the difference in price if a watch’s worth is totally original versus totally restored, but period correct and exactly the same?”. The lecture was concluded with ideas on the use of blockchain, serial number registries, third-party grading from institutions such as GIA and PSA and Wind’s SWOT (Strength, Weaknesses, Opportunities, Threats) Analysis for vintage watch collecting. Once again, the turnout for Wind’s lecture was incredible – it was HSNY’s largest turnout in at least 50 years. 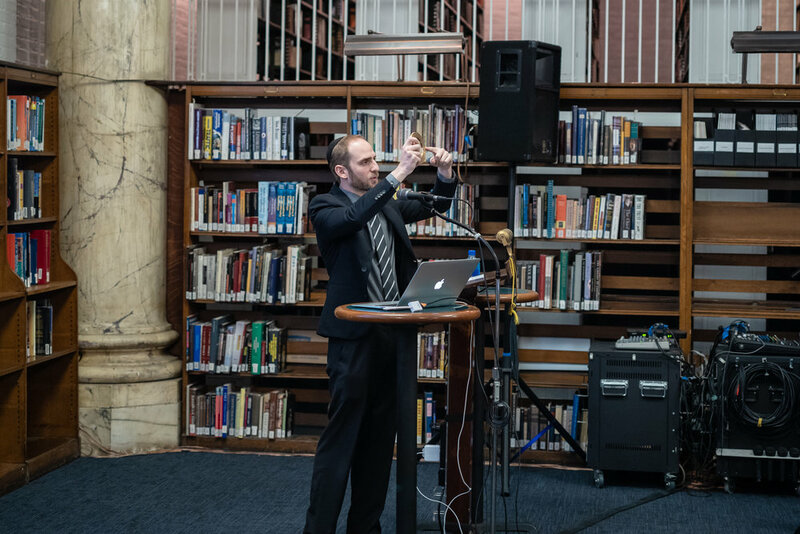 HSNY thanks Eric Wind for his fascinating lecture! 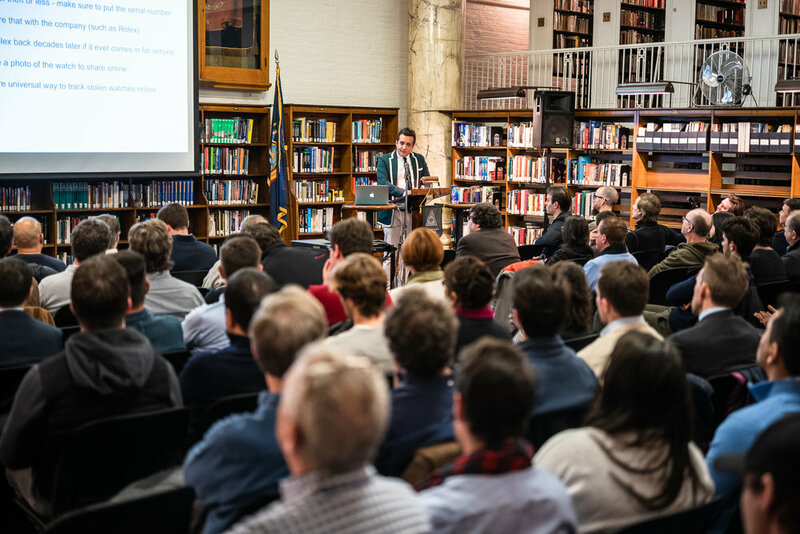 The record crowd at the Horological Society of New York's May Lecture. Photo by Atom Moore. 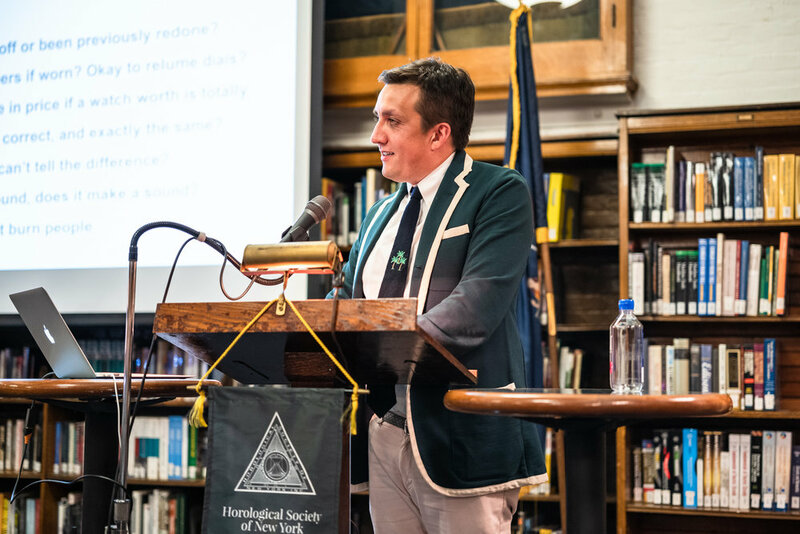 Eric Wind's recent lecture at the Horological Society of New York (HSNY) was fascinating, amusing and educational. But it was notable for another very important reason: it had the largest attendance at any HSNY lecture in over 50 years! 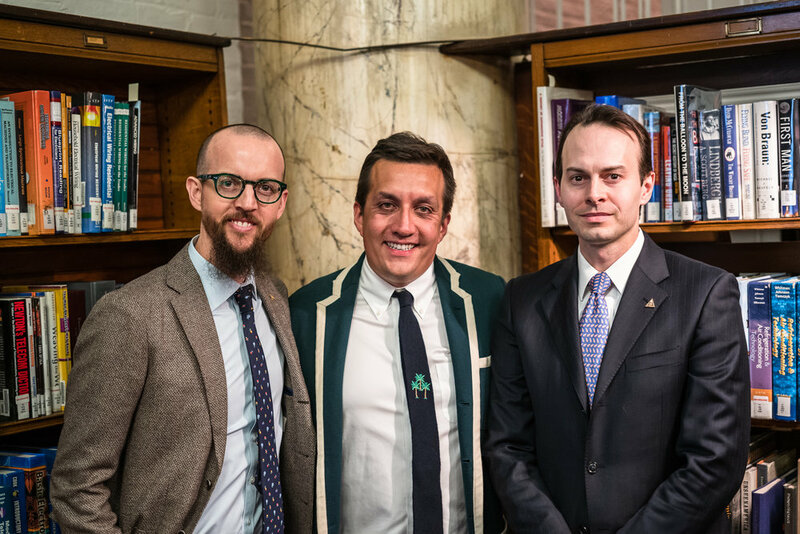 Nearly 200 people packed the landmark General Society Library in Midtown Manhattan to hear Wind speak, even though the winter weather outside was quite cold. Attendance at recent HSNY meetings has continued to increase to the point where free tickets are required to attend to prevent overcrowding. This is a great problem to have and shows the incredible enthusiasm for horological education in New York. 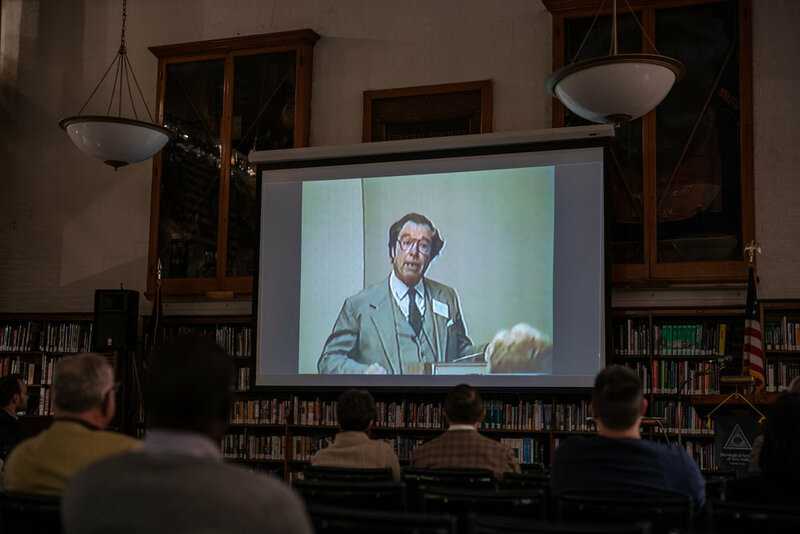 Panorama of the General Society Library during the Horological Society of New York's May Lecture. Photo by Atom Moore. 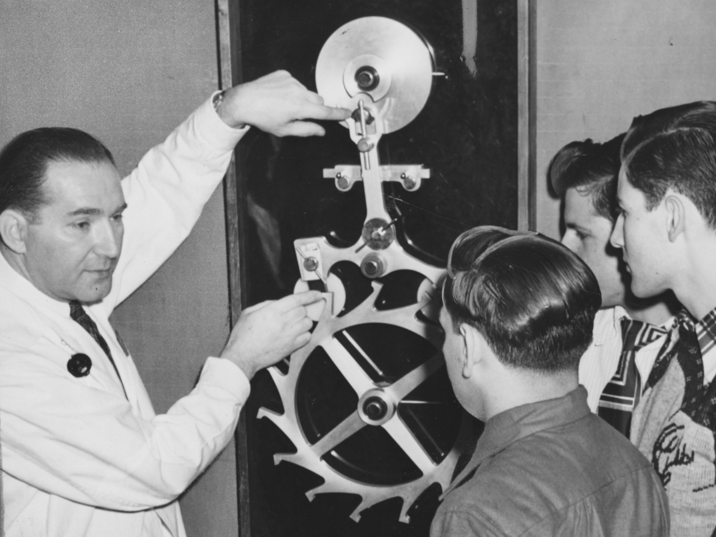 50 years ago, the American watchmaking industry was at its peak and HSNY's monthly meetings attracted huge crowds on a regular basis. Back then, HSNY operated as a 501(c)(6) business league, focusing on the needs of professional watchmakers. Today, HSNY is a 501(c)(3) non-profit, focused on horological education for the public. Looking back in the HSNY archives, we found a page from the May, 1950, Horologist's Loupe (HSNY's monthly newsletter) that shows a wonderful photo of the April, 1950, lecture, with over 500 people in attendance. HSNY is grateful for the continued support from our members and sponsors, and we look forward to seeing you at a lecture or class soon! Page from the May, 1950, Horologist's Loupe. HSNY’s 2019 Gala & Charity Auction will be held at the Manhattan Penthouse, an incredible venue with panoramic views of the New York City skyline. 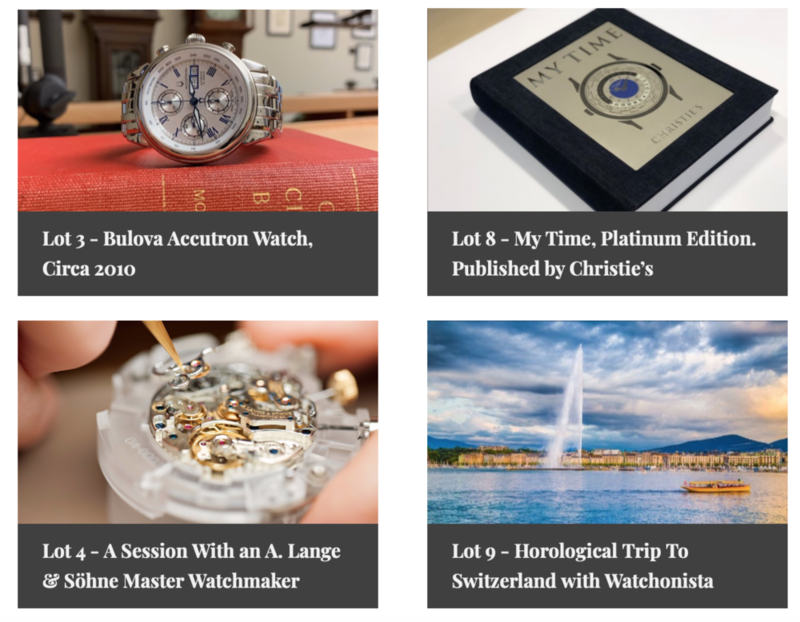 The Horological Society of New York is proud to announce the 2019 Charity Auction, presented by Christie's, which will take place at the Gala on Wednesday, April 17, 2019. A selection of extraordinary timepieces, exceptional experiences and horological miscellanea will be up for sale, with all proceeds benefitting HSNY's ongoing educational programs. There will be no buyer's premiums, and all bidding will take place live in the room. Absentee bids will be accepted via email until 24 hours prior to the Gala & Charity Auction start time. Preview will be held at the HSNY office & classroom from 2pm-4pm, Tuesday, April 16, 2019. 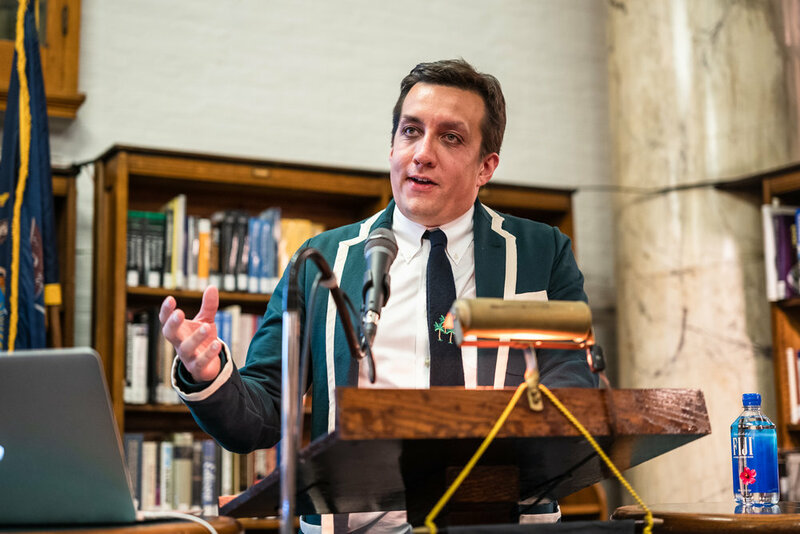 John Reardon, International Head of Watches for Christie's, calling the HSNY 2018 Charity Auction. Furthering the Horological Society of New York’s (HSNY) educational mission, a global leading art business Christie’s has joined as a sponsor. 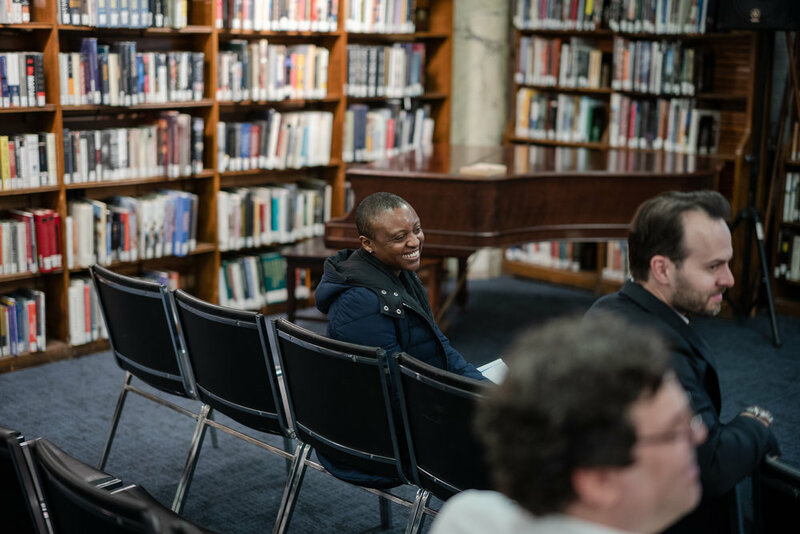 The auction powerhouse’s commitment to HSNY will help ensure the 153-year-old watchmaking guild continues its monthly lecture series, international horology classes, and financial aid for the next generation of watchmakers. Founded in 1866, the Horological Society of New York (HSNY) is one of the oldest continuously operating horological associations in the world. Today, HSNY is a 501(c)(3) nonprofit organization dedicated to advancing the art and science of horology through education. Members are a diverse mix of watchmakers, clockmakers, executives, journalists, auctioneers, historians, salespeople and collectors, reflecting the rich nature of horology in New York City; http://hs-ny.org. William Massena, Founder and CEO of Massena LAB, lecturing on how to win (and sometimes lose) at watch auctions, March 6, 2017. 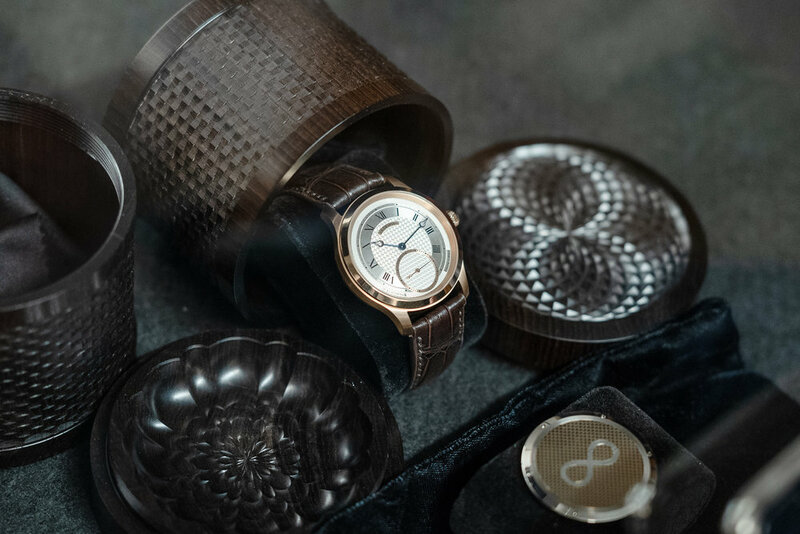 The Horological Society of New York (HSNY) announces artisanal watchmaking company Massena LAB has joined as a sponsor. 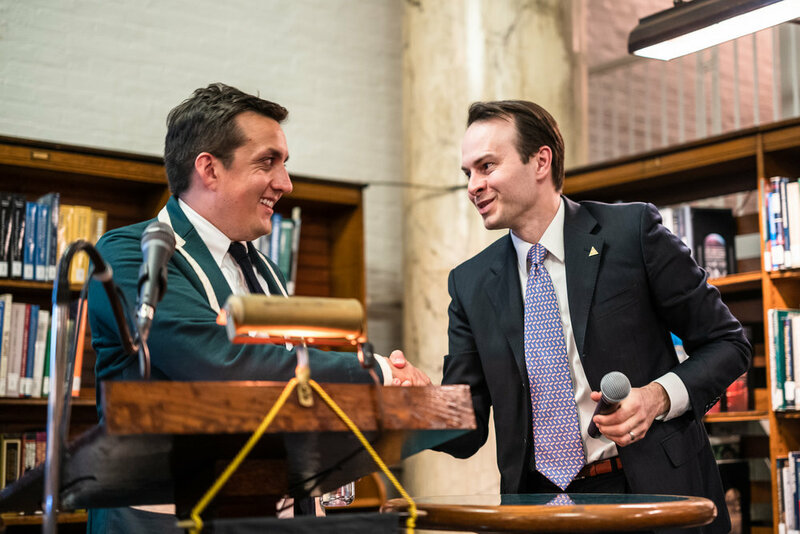 Helmed by William Massena, Founder and CEO of Massena LAB and Trustee of HSNY, the latest sponsorship directly aids America’s oldest watchmaking guild in fulfilling its educational mission. Massena LAB prides itself on partnering with independent watchmakers to conceptualize unique timepieces from sketch to wrist - echoed by HSNY’s mission to advance the art and science of horology through education. 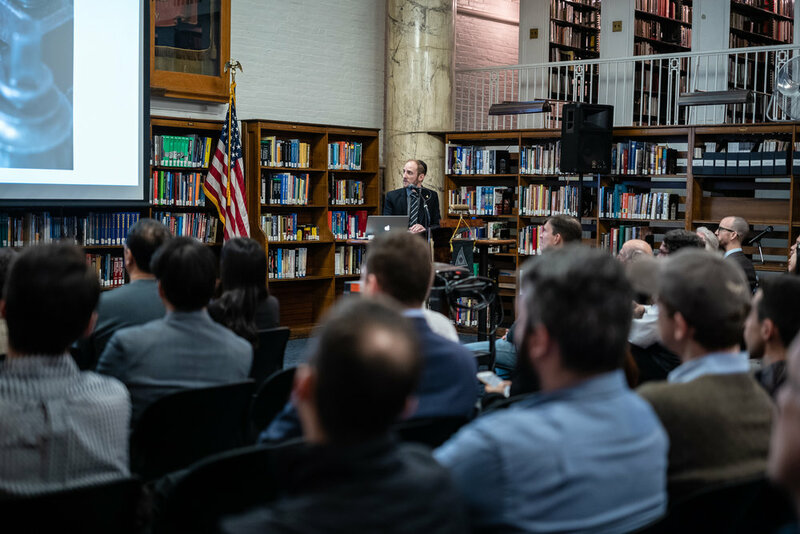 With Massena LAB’s support, HSNY is able to continue monthly lecture series, enhance horology classes worldwide, and secure scholarship opportunities for future watchmakers. Massena LAB was manifested from the desire to re-discover the craft of artisanal watch making in an age of saturated mass production, and aims to be a leader in producing rare, original timepieces. Have you ever been curious about the Horological Society of New York (HSNY) Education courses? Would you like to know more about the class setup and what can be gained from Horology 101 – 104? 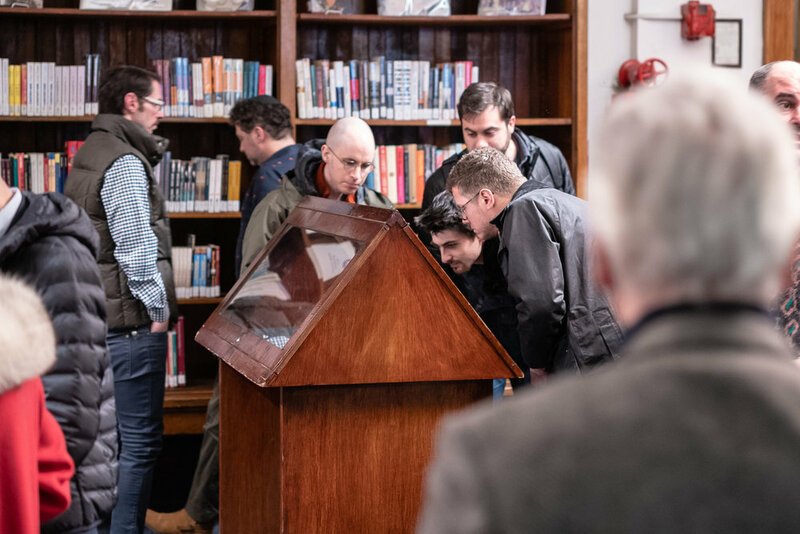 Curiosity recently brought the Atlas Obscura team to our headquarter, where Deputy Editor Samir Patel joined HSNY President Nicholas Manousos for a one-on-one lesson in horological education. Thank you to the entire Atlas Obscura team for creating a magnificent video showcasing a few of HSNY’s marvels. If you’re ready to take a class with us you can sign up here! A lot can happen in a century. Wars have taken place, scientific discoveries have been made, and pop culture has evolved drastically. But on a more microscopic level, there is an elite group of organizations that have not ceased to exist, serving their members, staying true to their missions, and evolving with the times. Today, the Horological Society of New York (HSNY) is officially one of them. Through this recognition, HSNY has solidified a spot in the history books alongside industry legends including Tiffany & Co., Cartier, Inc., The General Society of Mechanics and Tradesmen (home to HSNY’s classroom and office), American Heart Association, American Museum of Natural History and more. HSNY is grateful to be inducted as a member and especially gracious to its HSNY members who continue to aid in the mission to advance the art and science of horology through education. For more information about The Hundred Year Association of New York, visit https://100yearassociation.com. 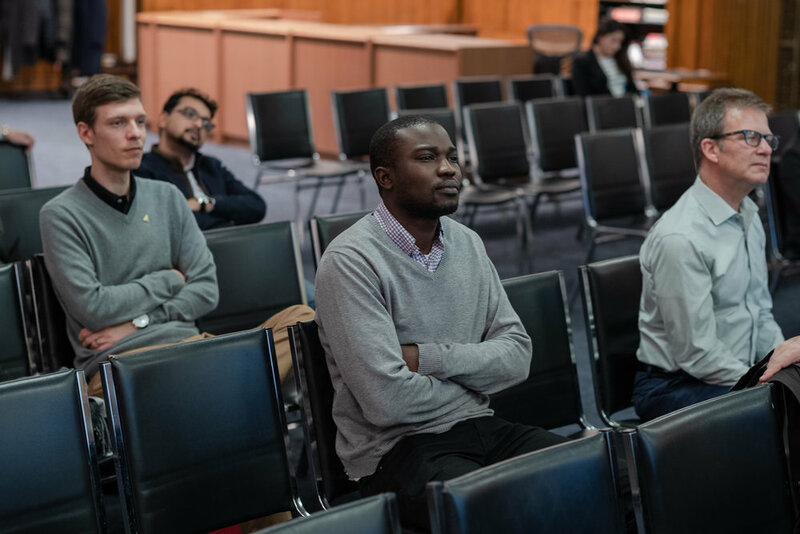 Watchmaking is a vibrant, rewarding and dynamic career, and the Horological Society of New York (HSNY) wants to help as many people study and enter the profession as possible. For 2019 the Henry B. Fried Scholarship is dramatically expanding, with multiple students to be awarded the $10,000 prize. The application period for the scholarship closes on Friday, March 1, and the scholarships will be awarded at HSNY's annual Gala & Charity Auction on April 17, 2019. Don't delay - get your application in today! Any student who has been accepted or is currently studying at a full-time watchmaking school in the USA is eligible for the Henry B. Fried Scholarship. Prospective students may also apply, with the understanding that the scholarship is contingent on their enrollment at a full-time watchmaking school. More information is available at HSNY's Henry B. Fried Scholarship page. Join HSNY on Monday, March 4, 2019 for a lecture on Collecting Vintage Watches: How to Avoid Common Mistakes, Issues for Collectors to Discuss, and the Future of the Market, by Eric Wind, Owner of Wind Vintage. With the explosive growth in interest and values for vintage watches in recent years, how can new collectors successfully navigate and enjoy the world of vintage watches? The field of vintage watches is in an interesting place with more minefields than ever in the realm of collecting, a staggering amount of animosity on social media and watch fora, and a concerning lack of curiosity around new watch scholarship today. 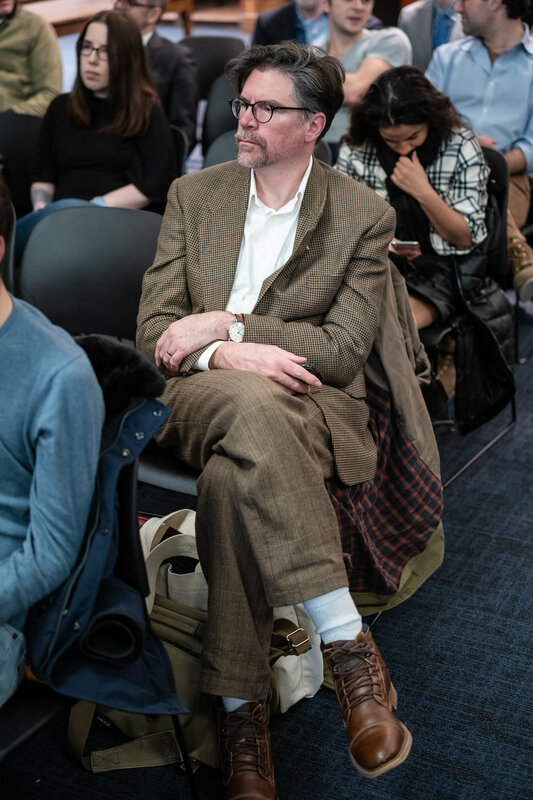 At the March 4, 2019, meeting of the Horological Society of New York, Eric Wind will discuss the common mistakes he sees beginning collectors making and also will raise important questions for the collector community to discuss, including restoration, tracking provenance, third-party grading and watch registries, how to educate those interested in acquiring vintage watches, and the future of the market. Don’t forget to purchase your ticket to the Gala & Charity Auction on April 17! How does engine turning work? What is the history of engine turning? Shapiro made sure to point out that ‘engine turned’ is spoken in English-speaking countries, whereas ‘guilloché’ is used everywhere else. The three machines that Shapiro highlighted were the Rose Engine Machine, Straight Line Machine and Brocading Machine. Rose Engine Machine: The most famous and recognized, the machine is used for circular lines as the transfer workpiece is stationary then locks. Images of the MADE Rose Engine Machine used by David Lindow and the Frank Dorian 1851 Custom Made exemplified the workings of rose engine machinery. A video of the rose engine showed an example of a hand-operated machine creating a heart-shaped rosette. The magnification (10x) of the pattern was to check that if the cutter is dull, the engine turning will be dull. Straight Line Machine: Though not as aesthetically pleasing as the rose engine, the straight line machine produces vertical line engraving. The bars are traced and the bar is moved to change the pattern. A video of the straight line machine showed a microscopic view (30x magnification) of the diamond pattern. Not only is the diamond a common pattern, it is also the easiest engine turning pattern to make. Straight line engine turning, however, calls for a border. The border patterns cover up the end marks - so when you are looking at a watch, see how the marks are covered up in straight line machining. Brocading Machine: Also known as ‘medallion machine’, this is unlike the rose engine or straight line machines because an active operator is not required. The automatic version of the machine produces a pattern that is utilized by Audemars Piguet for their Royal Oak dials. The rose engine was invented in the early 1500s and was more complex compared to the bow/pole lathes. The first engine turned watch was made around 1680 in a wave rose pattern. Also, keep in mind that the ornamentation was for royalty and the rich. Shapiro also pointed out the people who were key in engine turning history: Jean-Antoine Lépine, Pierre Benjamin Tavernier and Abraham-Louis Breguet. Jean-Antoine Lépine: French watchmaker (1720 - 1814) who created thin pocket watch movements. It is thought that Lépine influenced Breguet since A.L. Breguet may have apprenticed with Lépine. Although ‘Breguet hands’ are attributed to its namesake, Lépine actually invented the design. Pierre Benjamin Tavernier: Paris had skilled artisans that had the dual talent of case making and engine turning. Tavernier’s skill can be found on works for Lépine and Breguet. Abraham-Louis Breguet: There’s no denying the aesthetic influence Breguet has on numerous brands such as Patek Philippe. His earlier dials were originally enamel and the movements were considered works of art due to their complexity and skill of Breguet frosting (a.k.a. depletion gilding). Modern Breguet dials are now gold and plated in silver - before it was either gold or silver. Early 1900s: The popularity of engine turning began to burst - the rose engine and straight line machines are mass produced along with higher precision and quality during the Industrial Revolution. Items such as napkin rings, lighters, boxes, cigar boxes, pens, frames, eggs and several types of jewelry were receiving the engine turned treatment. The 30s, 40s and 50s: During these years, engine turning became popular on wristwatches. However, due to remarkably thin dials, there is the test of trying not to remove too much metal or else it goes through the dial. The 60s: The advent of quartz nearly killed the presence of engine turning due to no passing on of skills and machines being difficult to find. The 80s and 90s: Throughout these years, the revival of engine turning was slow. However, it was led by George Daniels in his book “Watchmaking”. Large Swiss watch companies began hoarding the machines - not for use - but for show. Derek Pratt, who has been compared to George Daniels, revitalized the Urban Jurgensen watch brand by using the technique. Other contemporary watch dial engine turners such as Roger Smith, Jochen Benzinger, Kari Voutilainen, David Lindow, Roland Murphy, Bernard Van Ormelingen, Calina Shevlin, Brittany Nicole Cox and nameless individuals at Metalem, Breguet, etc., are working to keep engine turning relevant and alive. Shapiro strongly wants to contribute to the expansion of engine-turning and horology, particularly in the United States. After accomplishing the Basket Weave technique (which took six years to accomplish since it is one of the most difficult patterns to do) he started a brand new pattern termed Infinity Weave. The pattern is made by making small boxes that are done one line at a time. Shapiro wanted to push himself to the limit with the Infinity Weave because it is very easy to make a mistake and the process needs to be re-done. For the future, Shapiro wants to continue with the Infinity pattern on 40mm cases and experiment with other metals. Finally, there are plans to engine-turn on UWD movements and to create an American made movement within two to three years. HSNY thanks Joshua Shapiro for his lecture! If you’ve visited the HSNY classroom and office you’ve most likely spotted silkscreen prints by Xavier Magaldi. Now, the Swiss artist is back in New York and exhibiting his “Temporality” collection at BOCCARA ART Brooklyn. On Thursday, February 28, 2019, the gallery will host a reception to exhibit Magaldi's artwork, an alumnus of the École d'horlogerie de Genève, whose inspiration stems from the geometric forms of horology juxtaposed with the free-flowing graffiti style. Through “Temporality”, Magaldi showcases steel sculptures that almost supersize the inner workings hidden on our wrists. Art (and horology) enthusiasts can RSVP to the opening reception taking place from 6PM - 9PM by clicking here. For more information on BOCCARA ART Brooklyn, visit https://boccara-art.com. To learn more about artist Xavier Magaldi, visit https://xaviermagaldi.com. Update: This exhibition will now be on view through April 6, 2019. Furthering the Horological Society of New York’s (HSNY) educational mission, Japanese watch manufacture Grand Seiko has joined as a sponsor. 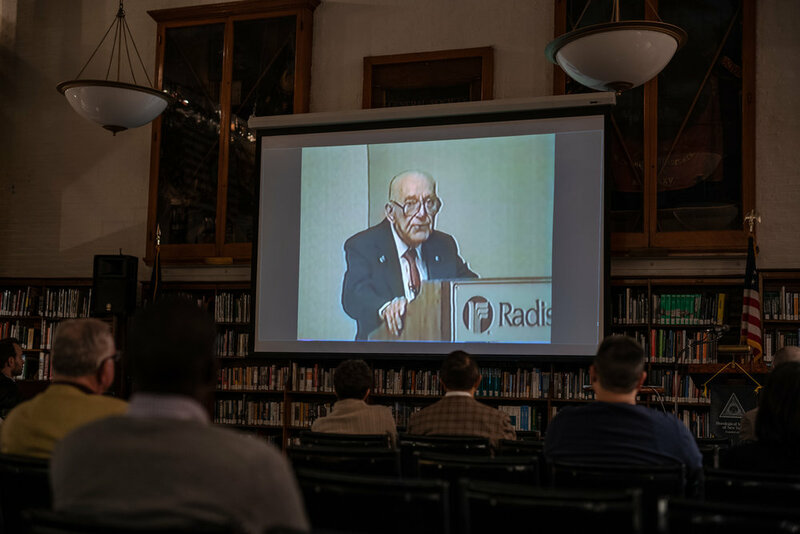 Grand Seiko’s generous support will enhance HSNY’s 153-year-old monthly lecture series, horological education classes in the New York City classroom and abroad, watchmaking scholarships, and extensive horological library with precious texts. HSNY members receive a lapel pin. 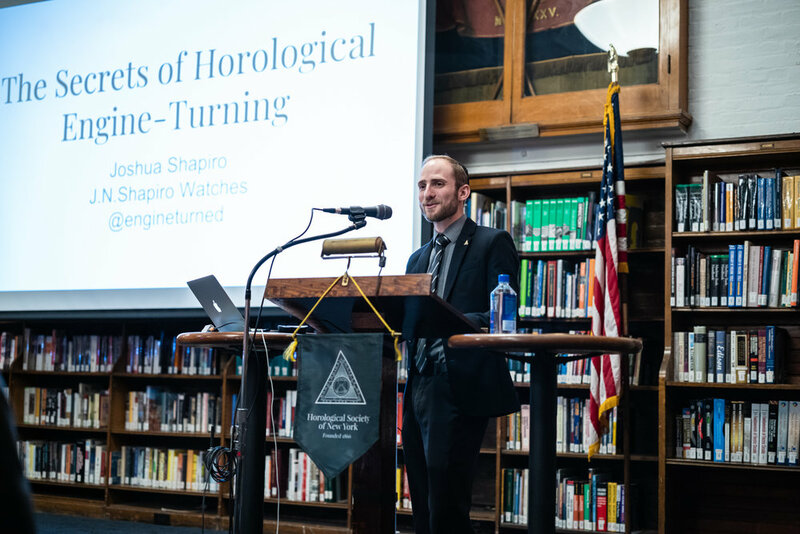 After a wildly successful year of Traveling Education, the Horological Society of New York (HSNY) announces today the launch of its 2019 courses, commencing in San Diego and Chicago. Watch enthusiasts will get a taste of what it’s like to be a watchmaker with stops in San Diego, hosted by Passion Fine Jewelry on February 2-3, following a Midwest visit to Chicago’s Oak & Oscar on February 16-17. The 153-year-old Society, whose mission is to advance the art and science of horology, will revisit both cities - and hosts - backed by popular demand. 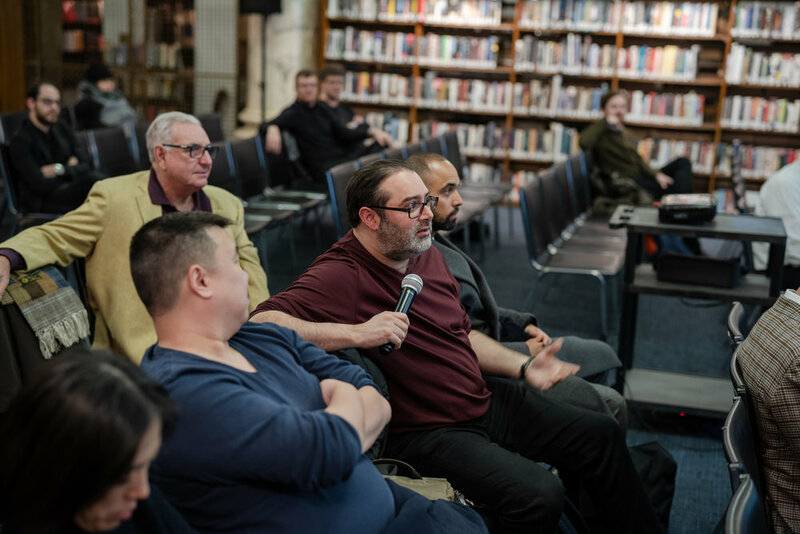 Each Traveling Education course is taught by HSNY expert watchmakers who work one-on-one with students and cover material from Horology 101-103 classes taught weekly in New York City. During a four-hour course, students will have the opportunity to disassemble and reassemble a complete ETA 6497 mechanical movement and gain a comprehensive understanding of modern horology. No previous experience is required to take this course. Last year, HSNY’s Traveling Education made stops throughout the United States and launched an International Traveling Education program which received rave reviews from attendees in Toronto, Canada and Singapore.